And by “party” I mean the one that’s about to happen in your mouth (Minds out of the gutters, people!). You know how sometimes you can have two best friends and you think they’re both just the awesomest. You think the only thing that could be better is if these two friends met and became good friends themselves but then the total opposite happens and they kind of despise one another? That’s absolutely NOT the case here. 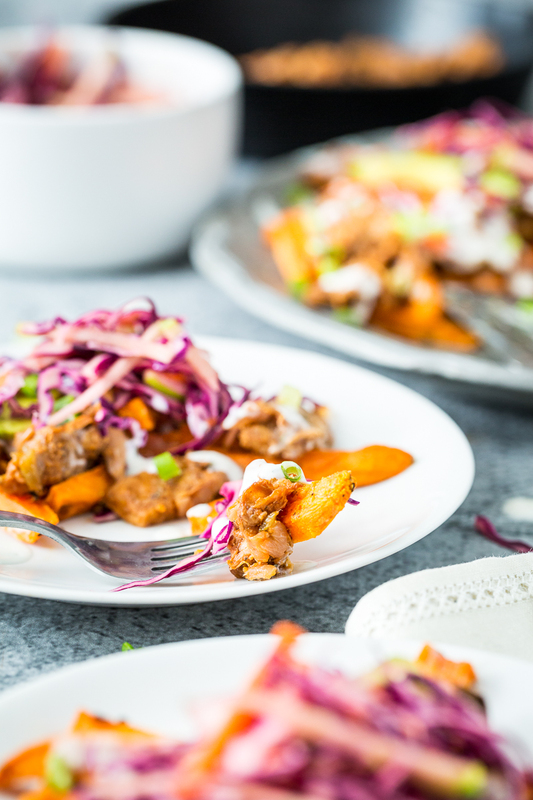 You may or may not be surprised to learn that sweet potato fries and tangy slaw get on quite well, those two. Especially when their mutual BFF, BBQ jackfruit is in the picture. Then it becomes, you guessed it, a crazy delicious mouth party (CDMP). 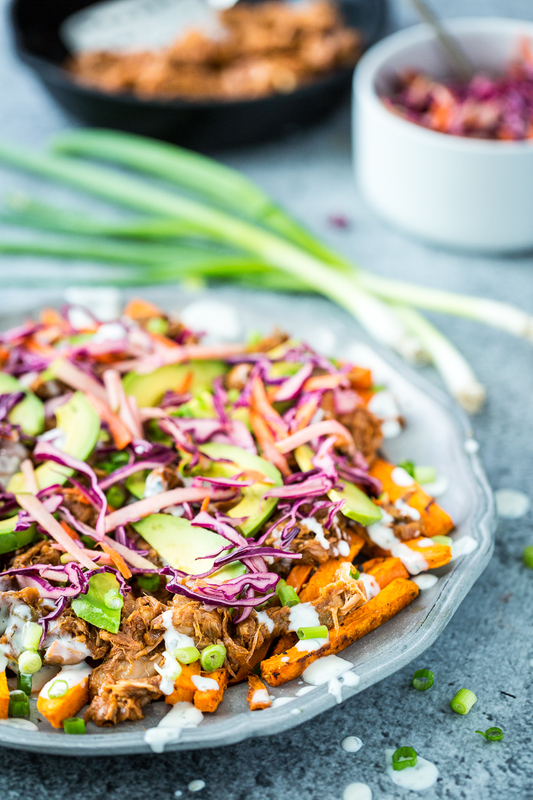 Long-time readers may remember that about this time last year, I shared the recipe for my BBQ Bowl which included something BBQ-y, sweet potatoes, and zesty ranch dressing. Obviously, this time of year, this combo is my jam. This dish, this CDMP, contains several of the same elements. 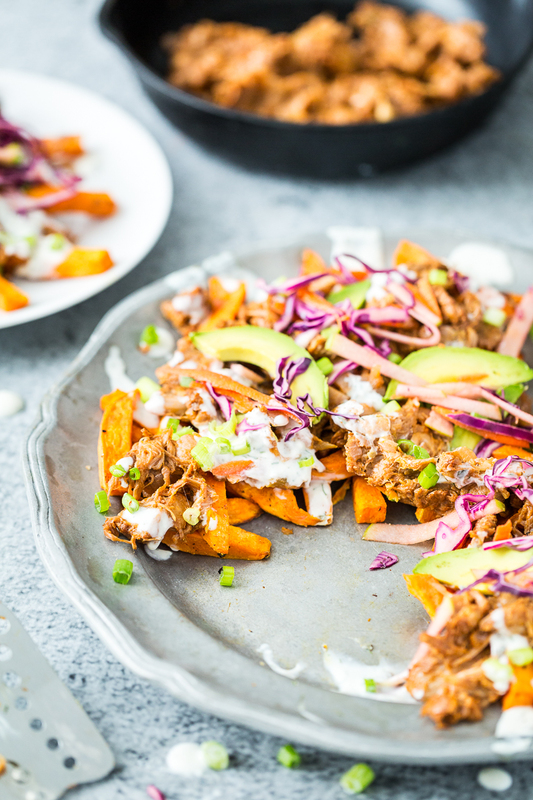 It starts with a big ol’ pile of oven-baked sweet potato fries, topped with BBQ jackfruit (made with Jalapeño Plum BBQ Sauce), avocado slices, green onions, a generous drizzle of zesty ranch dressing, and a bounty of tangy red cabbage and apple slaw. If I was going to get scientific about it, I would say that the sweetness of the sweet potato accentuates the sweetness of the BBQ sauce while the tartness of the slaw brings out the sauce’s tanginess. The creaminess of the ranch and avocado provide a perfect balance so that your tastebuds aren’t overwhelmed with the rich, delectable flavor. But you didn’t come here for science talk. 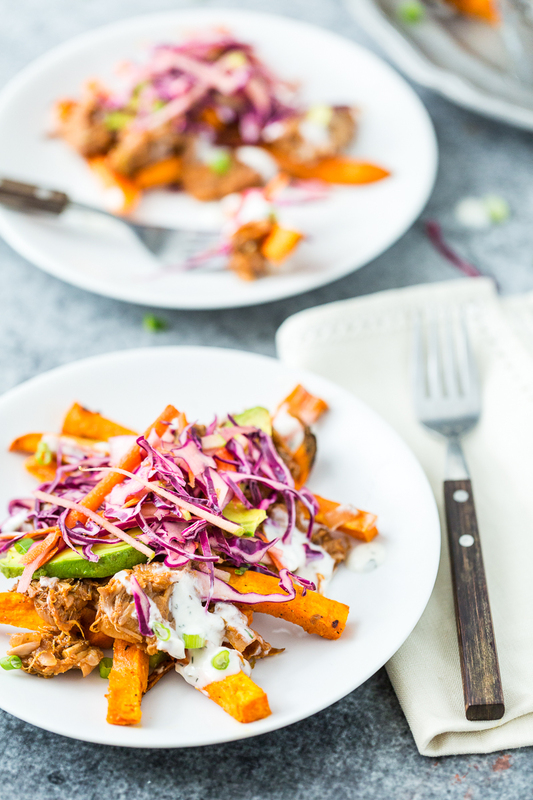 All you need to know that these loaded sweet potato fries are incredible and sure to be one that you’ll make time and time again. At least, I know I will. I love a good CDMP. Make this at least one hour prior to serving. Combine the cabbage, apple, and carrot in a large bowl. In a cup, mix together the sherry vinegar, maple syrup, and Dijon mustard. Pour the liquid mixture over the slaw and toss to combine. Cover the bowl and refrigerate for at least one hour (or up to a couple days). Place one rack at the very top of the oven and one in the middle. Preheat the oven to 425 F and line a baking sheet with parchment paper or a silicone baking mat. Spread the fries out on the prepared sheet and spray with olive oil. Top with paprika, salt, and pepper. Toss until combined. Place the sheet on the top rack of the oven and bake for 25 minutes, tossing once halfway through to ensure even cooking. As soon as the sweet potato fries are in the oven. Begin preparing your jackfruit. Use your hands to tear the jackfruit into shreds. In small bowl or cup, mix together a 1/2 cup of BBQ sauce with arrowroot powder. Set aside. Line another baking sheet with parchment paper or a silicone baking mat. Heat the olive oil in a large shallow sauce pan over medium heat. Add the onion and cook until just translucent. Add the jackfruit and liquid aminos and cook until the liquid has been absorbed. Add a 1/2 cup of BBQ sauce (_without arrowroot powder_) to the jackfruit and stir until combined. Let cook for 4 to 5 minutes, stirring occasionally, or until the liquid has been absorbed and the jackfruit is beginning to stick to the pan. Add the BBQ sauce/arrowroot mixture to the jackfruit and stir until combined. Spread out on the prepared baking sheet and place on the middle rack of the oven. 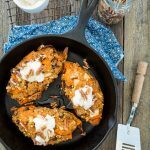 Let it bake until the sweet potato fries are done cooking (or at least 10 minutes). 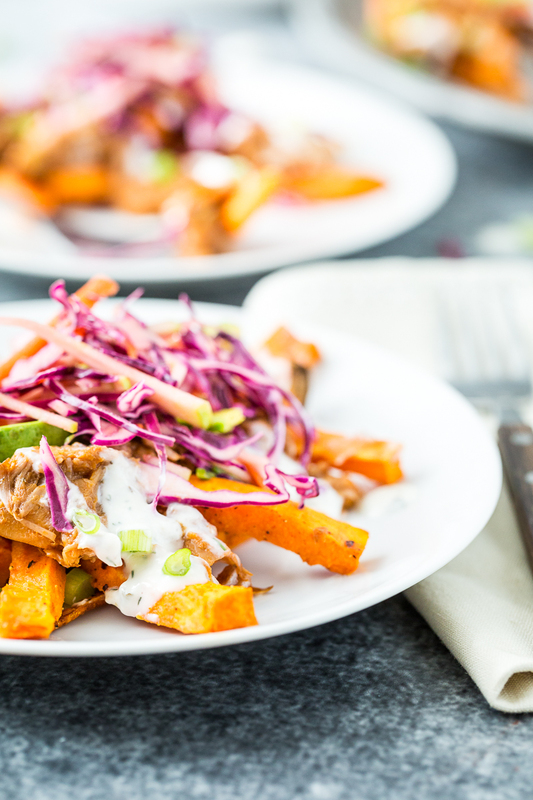 Spread the sweet potato fries out on a large plate or platter. Top with with the BBQ jackfruit. 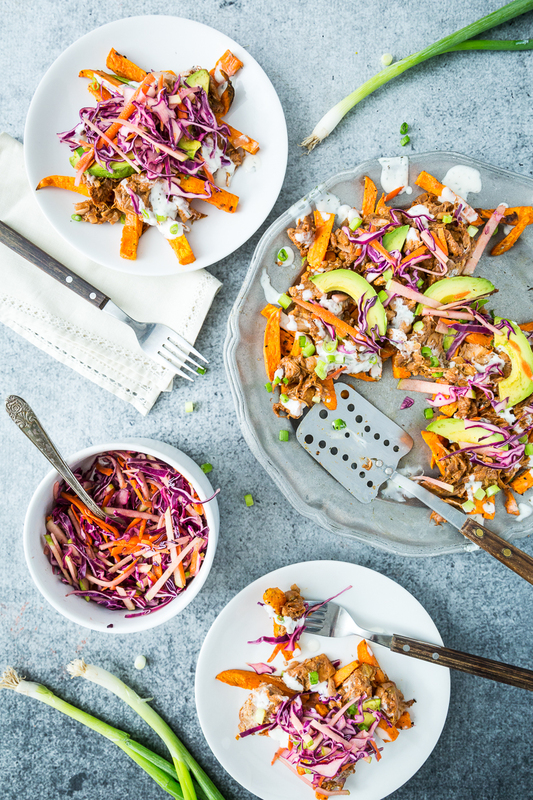 Top the jackfruit with avocado slices and chopped scallions. Drizzle the ranch dressing over the top and finally, top with a generous pile of slaw. People can serve themselves or alternatively, you can follow the same assembly steps on individual plates for each serving. Serve immediately. Enjoy! By baking fries on the top rack, it lets them get fully cooked on the inside but being farther from the heat, it allows them to get a crisper outside. Dining in San Jose: Power Bowl Sonoran Tacos + A Review of Vegan Tacos by Jason Wyrick & a GIVEAWAY! 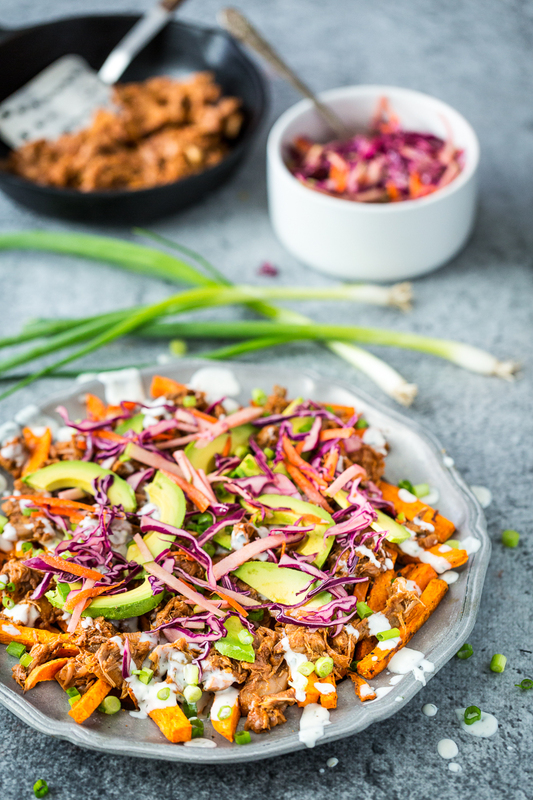 13 Responses to "Loaded Sweet Potato Fries with BBQ Jackfruit & Red Cabbage Apple Slaw"
i’m ready for this cdmp! Oh this looks incredible! So many wonderful colors and flavors. 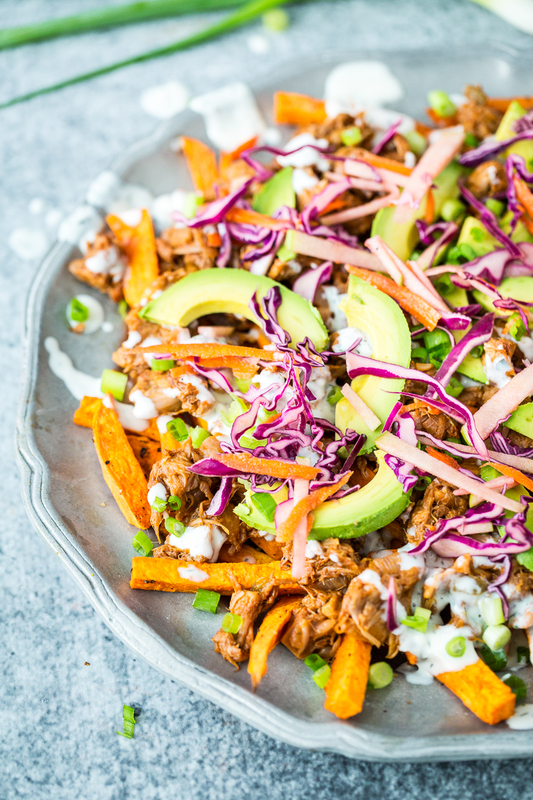 I’m totally down for loaded sweet potato fries! I’m amazed at your talent for pairing unusual ingredients to create a mind-blowing meal. This looks AMAZING. Can I come over for dinner? I *love* sweet potato fries! Those look amazing! all I can say is YUM! I do have a quick question, with jackfruit, do you purchase with brine or water? thanks so much! Oh…DROOL!! These are amazing and I need them! Don’t think anyone can say “being vegan is limiting” when you can eat these. Pinning now! This motivates me to try jackfruit! Sounds wonderful! 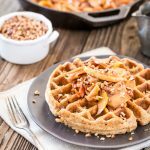 Is there am alternative to the jackfruit? I am in Australia and can only buy fresh jackfruit but it is not in season. This looks amazing – fresh and colorful. Thanks for the recipe. Made this for dinner tonight and served to newly vegan guests. FABULOUS!!! 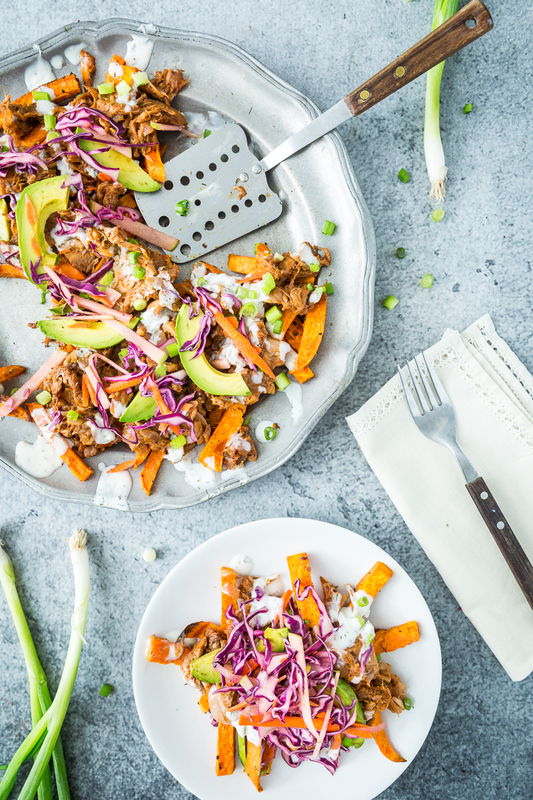 The kicker – I just overheard my non-vegan son telling a friend about the jackfruit he had for dinner and how good it was!! A winner for sure. I had a mix of frozen and canned jackfruit. The canned is much better for the recipe, but has too much sodium for us.